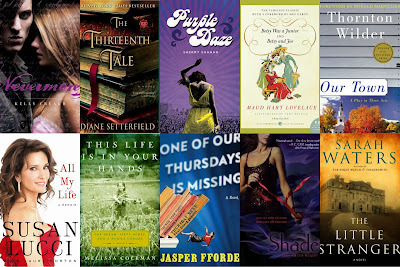 The Sunday Salon: April Books Recap [5.1.2011] – my books. my life. So apparently it is May. I was pretty sure April didn’t actually happen until I went back and realized I read TEN books. Yep, 10. This is my first month ever in double digits. I have the readathon to thank for that but I’m going to pretend I could do it anyway. So what did I read? Hmm, I’m still going with April didn’t actually happen. I’m envious of the bloggers doing readathon, so many books! April has been a great reading month for me, but that is only because I have been sitting on my toosh due to an ankle injury. It has been nice just being able to sit and read though. I also loved The Thirteenth Tale and am glad to see that you liked it enough to read it twice! Wow! Ten books! Impressive! Looks like you had some good reads, too–many of which are on my TBR list. Since I’m only reading stuff for school, I’ll have to go with Margaret Edson’s Wit. It was good enough to make me interested in watching the film version.